Published 2006, Zoological Journal of the Linnean Society 148(3): 343-394. Online access. Abstract. The Palaeoheterodonta is a diverse clade consisting of the freshwater bivalve order Unionoida and its marine sister group, Neotrigonia. Neotrigonia is the sole surviving genus of the Trigonioida, known from only 6 species in Australian waters. Unionoids (freshwater mussels), in contrast, are widespread on all continents except Antarctica and represented by ca. 900 species. Discussion is biased towards the freshwater mussel condition, but Neotrigonia is crucial as a living fossil for establishing the plesiomorphic states of unionoid synapomorphies. Neotrigonia retains many of the characters of the ancestral heteroconch. Our object is to provide evidentiary support for the natural classification of the extant Palaeoheterodonta. A supermatrix of 50 taxa and 1183 characters was constructed from 62 previously published DNA sequences of mitochondrial cytochrome oxidase subunit I and 28S nuclear ribosomal DNA, 15 novel sequences, and 59 morphological characters. Published COI sequences for Coelatura aegyptiaca, Pseudomulleria dalyi and Obliquaria reflexa were treated as potentially problematic due to their (1) inconsistency under different methodological assuptions and (2) conflict with other data sets. Each partition was analyzed under the criterion of parsimony separately and in combined analyses; analyses were run both with and without the problematic sequences. Based upon our Combined Evidence topology (with problematic sequences excluded), the Unionoida is monophyletic based upon 8 synapomorphies, including larval parasitism, brood protection and restriction to freshwater. The order is comprised of six families in two superfamilies, Unionoidea and Etherioidea: ((Unionidae + Margaritiferidae) + (Hyriidae + (Etheriidae + (Mycetopodidae + Iridinidae)))). The morphological synapomorphies of these taxa are discussed with an emphasis upon both diagnosing taxa and highlighting areas of ambiguity and missing data. Three appendices provide descriptions of the morphological characters (I), a diagnosis of apomorphies for all branches of the phylogeny (II) and a family-level classification of the extant Palaeoheterodonta, including a complete synonymy (III). Data Matrix. grafcummings_combo.txt. Diagnoses of morphological characters. Click here to download a zipped archive the data, tree files and logs from all parsimony analyses. Published 2006, Chapter 9 in C.F. Sturm, T.A. Pearce & A. Valdés (eds. ), The Mollusks: A Guide to their Study, Collection, and Preservation. American Malacological Society, Universal Publishers. pp. 111-146. "This chapter is a general guide to collecting, identifying, and curating freshwater mussels based upon our years of experience in the field. It is not meant to be an exhaustive guide but it does contain information learned through trial and error and the experience of others in the field." Published 2006, Chapter 25 in C.F. Sturm, T.A. Pearce & A. Valdés (eds. ), The Mollusks: A Guide to their Study, Collection, and Preservation. American Malacological Society, Universal Publishers. pp. 313-325. Published 2006, Proceedings of the Academy of Natural Sciences of Philadelphia 155: 163-194. On BioOne. Abstract. The aquatic fauna of the Angola region in southwestern Africa, including the Cuanza (= Kwanza), Cunene, Okavango, upper Zambezi, Cassai (= Kasai) and lower Congo basins, is poorly known. 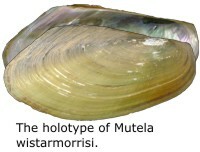 The freshwater mussels (Mollusca: Unionoida) of the region have received little attention, and then usually as fringes to the Congo and Zambezi-Okavango systems. 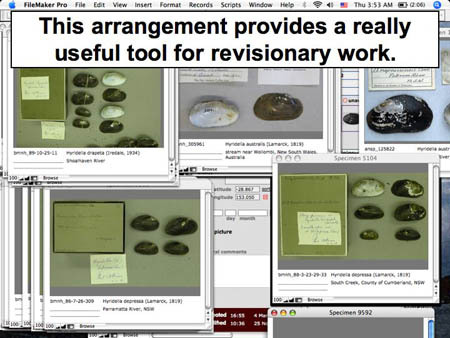 All available freshwater mussel specimens from thirteen major mollusk collections were examined and, along with a literature review, form the basis for this checklist. Twenty-three species in three families (Etheriidae, Iridinidae and Unionidae) are recognized from the Angola region, eight of which are newly recognized in the region or had not been treated as valid in recent revisions (Mandahl-Barth, 1988; Daget, 1998). One of these species, Mutela wistarmorrisi, is new to science and described herein. Chambardia welwitschi (Morelet), a widely recognized subspecies, is elevated to species-level status, and four more names are resurrected to valid status from synonymy: Mutela langi Pilsbry & Bequaert, Chambardia moutai (Dartevelle), Coelatura stagnorum (Dautzenberg) and C. rotula Pilsbry & Bequaert. Mutela legumen (Rochebrune) is recognized as the senior synonym for the species formerly referred to as Mutela carrei (Putzeys), and the known range of Aspatharia subreniformis (Sowerby) is expanded to include the Cunene, Okavango and Zambezi basins. Figures of each species are provided, and known distributions and persistent taxonomic issues are discussed. An appendix lists geocodes for localities associated with specimen records. Click here for the online version of the checklist. The data have also been incorporated in the MUSSEL Project Database. Presented to the Malacological Society of Australasia, 6-8 December 2006, University of Wollongong, Wollongong, New South Wales. Abstract. In most areas of the world, it is difficult for local stakeholders to revise the taxonomy of their provincial molluscan faunas because the majority of the collected specimens, including the types, are deposited in the collections of the United States and Europe. As part of an USA-NSF funded project to revise the freshwater mussels of the former Gondwanan continents, we have assembled the specimen records from 14 major molluscan collections into the MUSSEL Project Database (MUSSELpdb). As portions of this virtual collection are verified, georeferenced and combined with associated literature-based data, we have made subsets available via the MUSSEL Project Web Site (http://www.mussel-project.net/), including all specimen records so far captured for the Australasian freshwater mussels (Australia, New Zealand, New Guinea and the Solomon Islands). As of October 2006, the MUSSELpdb contained 2662 records from Australasia, representing at least 30 species in two families (Unionidae and Hyriidae). Hopefully, the online version of the MUSSELpdb will facilitate more researchers taking a global perspective on their local freshwater mussel faunas. Our talk will describe our methods, summarize the database structure and demonstrate its utility for revision work. This slide shows a screen dump of the "Image Pile" function of the MUSSELpdb at work. Invited lecture presented to the Jersey Cape Shell Club, 2 October 2006, Stone Harbor, New Jersey. Also presented to the Philadelphia Shell Club 18 January 2007, Philadelphia, PA. A shortened version was presented to the Board of Trustees of the Academy of Natural Sciences on 17 October. The objective of this non-technical lecture was to introduce the history of freshwater mussel research in Africa, modern methods of analysis (including the MUSSEL Project Database), and some of the patterns of distribution of African freshwater mussels. 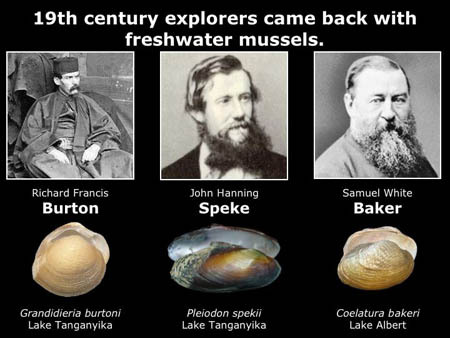 This slide shows just three of the freshwater mussels named for famous explorers of Africa. Invited plenary lecture during the 2006 meeting of the Egyptian German Society of Zoology, 5-9 March, Fayid, Egypt. The objective of this lecture was to review the global distribution of freshwater mussels (Order Unionoida), with an emphasis on Africa and especially the species of the Nile. It was copiously illustrated and generally well received. 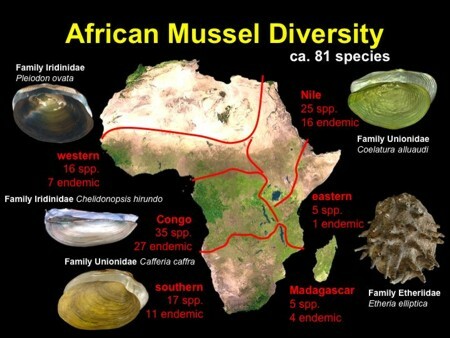 This slide depicts the distribution of African freshwater mussel assemblages, with an emphasis on endemism.